Marla Coppolino has worked as a science illustrator for more than 20 years, but recently she took her artistic skills to the streets of Ithaca to paint two electrical boxes at the intersection of Albany and Court Streets. Coppolino’s boxes were part of the 21 Boxes project commissioned by the City of Ithaca through the Public Art Commission. Through the project, artists were contracted to paint electrical boxes around the city. “I enjoyed doing this public painting project because I feel it gives everyone the chance to stop and appreciate artwork, right there by the street, along their daily walks,” Coppolino said. Coppolino works at Cornell University, but is also an artist and a malacologist, meaning she studies land snails on the side. The artists who create public art in Ithaca say they would like their works to open a dialogue among community members. Click the graphic above to check out an interactive map of street art in Ithaca on Ithaca Week. Public art projects in Ithaca are not solely the work of the Public Art Commission. The Downtown Ithaca Alliance spearheads the “Art in the Heart” project with support from the commission. The “Art in the Heart” project displays pieces from mid-June to mid-November. The alliance has been using Cayuga Street and Creek Walk for art corridors. “We always like to buy more public art but we are now in a situation where we need to find places for our pieces,” Kris Lewis, operations director of the Downtown Ithaca Alliance, said. She said that in the commons re-design, only two spots were slated for public art. Despite the great support for public art in Ithaca, graffiti is still an occasional problem. It is rare that a commissioned piece of art is graffitied, but it does happen, commission members said. They said they would like to redirect the energy of those who do the graffiti into making more permanent public art. 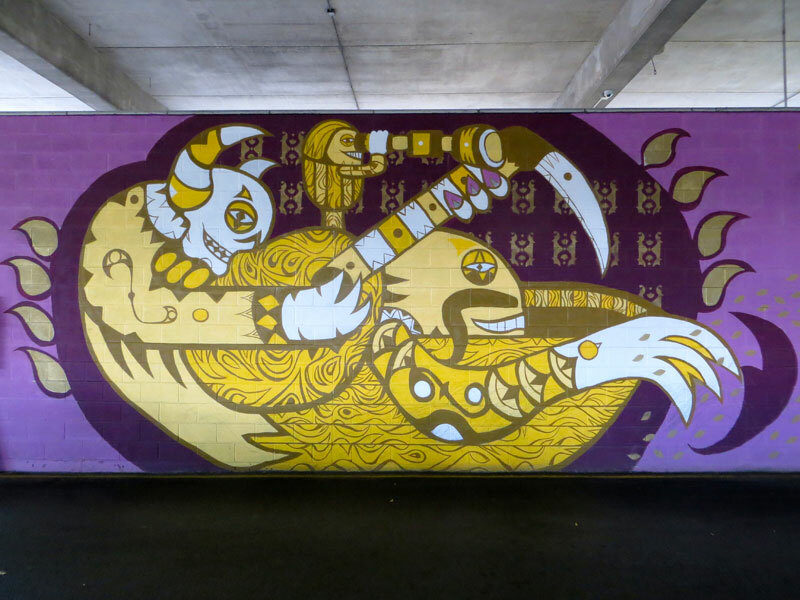 “I would love for some of these graffiti artists to have time to be able to make beautiful pieces. Some of these pieces that are just done on the run aren’t as nice for me,” Caleb Thomas, a commission member, said. City resources that are used to cover graffiti could instead go to employing the people who are doing the graffiti, Frank Nagy, director of parking for the Department of Public Works, says. The artists and those commissioning the work, whether part of the commission or the alliance, share a vision for what public art brings to the Ithaca community. “I think it’s important to have public art. It enlivens a community and we feel very committed to continuing to have a public art exhibition,” Lewis said. Read this story on Ithaca Week. 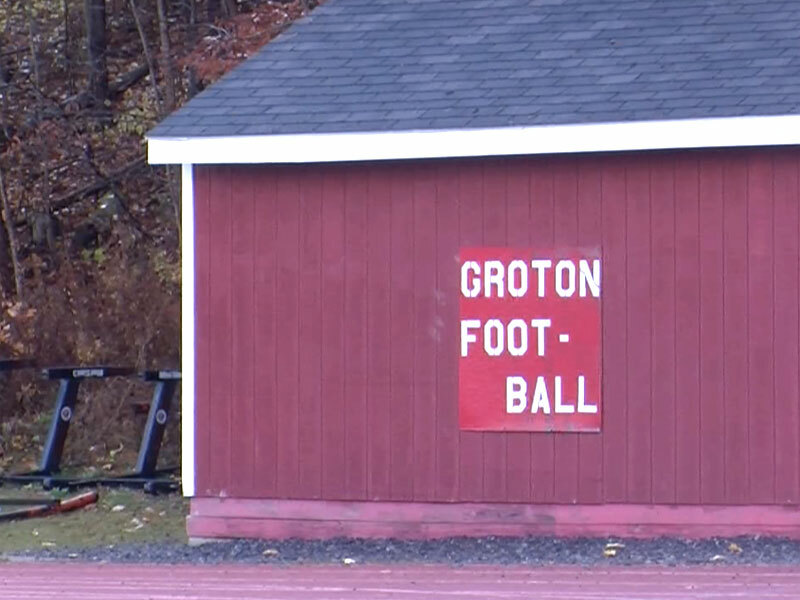 Two students on the Groton High School football team pleaded guilty on Oct. 31 to first-degree harassment, a misdemeanor, following hazing allegations. The Groton’s students sentencing will take place over the next six to eight weeks and will be handled by Town Justice Arthur Dewey Dawson. In response to the controversy, the high school administration is making changes to its athletic code. Of the 14.7 million U.S. high school students, approximately 1.5 million — or nearly 10 percent — experience hazing each year, according to data from the U.S. Department of Education and an Alfred University study. Click the image above to view a video report from Groton High School. Groton High School is responding to the allegations with a multi-step plan, Billie Downs, associate principal and athletic director, said. He said the plan includes: hazing prevention presentations with Travis Apgar, the dean of students at Cornell University, which will be presented to parents and coaches; student-athlete workshops on leadership and positive team building; increased supervision in locker rooms; and DASA (Dignity for All Students Act) in-house training for coaches. DASA is New York State legislation that seeks to provide students with a safe learning environment free of discrimination and harassment, and went into effect July 2012. Abrams has a hands-on role in the district’s plans for preventing this type of behavior among students in the future. “We are a small school district. The superintendent has always worked closely with all departments,” he said. Click the image above to view an interactive graphic. Cheltenham High School, in Montgomery County, the suburbs of Philadelphia, recently experienced its own hazing scandal involving its boys’ soccer team. The district notified police and conducted an internal investigation in response to September hazing allegations, but the team was allowed to finish out its season, which ended Oct. 16. Click here to view a video report from Groton High School. Fourteen people, including church-goers, college professors and community activists, gathered at the Unitarian Church of Ithaca Wednesday Oct. 29 to discuss the possibility of bringing the Fellowship of Reconciliation, or FOR, back to Ithaca. Jim Murphy, who heads up the Veterans Fellowship of Reconciliation, is leading the effort to relaunch an Ithaca chapter of FOR, which is the nation’s oldest interfaith peace organization. He called the meeting Wednesday to see what role FOR’s greater organization could play if reintroduced. Veterans’ outreach is what first brought Jim Murphy to FOR. The Veterans FOR serves Iraq and Afghanistan veterans through an emergency food plan set up with local Wegmans and GreenStar, as well as sending books to those who are in prison, Jim Murphy said. Meeting attendees Wednesday night spoke to FOR’s trouble attracting young members, but acknowledged that Ithaca could be fertile ground for revitalizing the fellowship with politically active youth. 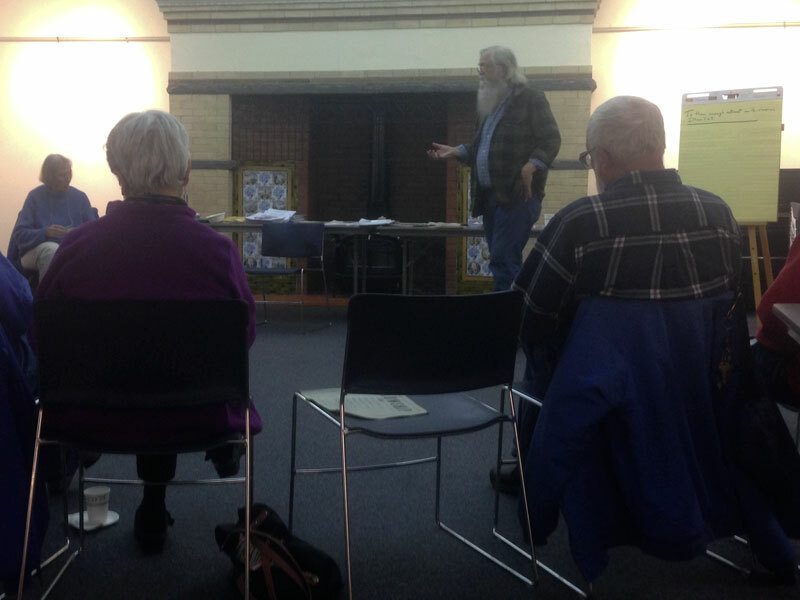 Susan Murphy, a member of the Unitarian Church and part of the team working to bring FOR to Ithaca, said the meeting echoed FOR’s national concerns by identifying the lack of established venues for local youth to politically express themselves. Mary Heckler was heavily involved with the Hudson Valley FOR in Nyack, New York, before retiring to Ithaca, and formerly served as FOR’s event coordinator, volunteer coordinator and house manager. After the meeting, Hecker said FOR could wind up connecting various local organizations in order to address local and national issues. “I think that what came out tonight about the racism and the drone work and the lack of communication within the town itself, within the community, college communities as well as everyday community, is lacking,” Heckler said. Click the photo above to view an interview with Susan and Jim Murphy following the Oct. 29 meeting. With its reemergence in the Ithaca area, the Murphys said FOR is looking to establish relationships with local chapters of other national and international organizations that focus on issues relating to war, race and the environment. One such organization is the Ithaca chapter of Amnesty International. Wayles Browne serves as the chapter’s treasurer and attended the meeting. He said he was delighted to see people of various faiths in attendance. In response to meeting attendees’ calls for improved communication among local faith and organizing groups, Jim Murphy created an online talking circle that allows community organizers to submit and receive emails about their various events and projects. Browne said he was pleased with the email group and has already used it to send out notice about the Amnesty chapter’s annual fundraiser, which was Sunday afternoon. It is one of the first instances in which the attendees of what may be a new FOR chapter coordinated their efforts. Click here to view a video interview with Susan and Jim Murphy.